We have a unique claim to the longest continuous lineage of Architects in one family. Anthony Goddard is the sixth generation of Architect in the Goddard family, continuing a lineage started by Joseph Goddard (1751-1838) when he founded a practice in Leicester in 1834, the same year as the RIBA. 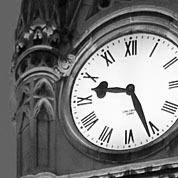 Many of the iconic buildings of Leicester are attributed to the Goddards, including the Leicester Clock Tower of 1868. Goddard Manton was established in May 1972. Founding partners Anthony Goddard and Don Manton first met working at Cusden Burden & Howitt. Anthony Goddard had previously won the Fulbright Scholarship for Research in 1966-1967 and lectured at the University of Illinois. Don Manton had studied in Australia and worked with Howlett & Bailey. 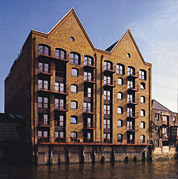 The first office was in Connaught Street and work included Oliver's Wharf, the first warehouse to be converted to residential use. 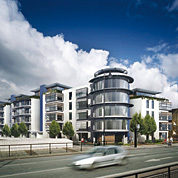 In the early 80s we achieved an early planning permission from the newly formed LDDC with the St John's Wharf project. 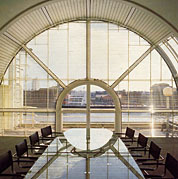 The practice enjoyed the patronage of Samuel Smith Breweries, which brought further connection with London's docklands and allowed us to convert some unique buildings. The practice was recognised with RIBA NETAS Awards for the office project at St Katherine's Way and the conversion of St John's Wharf. The 90s was a decade of growth coming out of the recession at the start and culminating in some break-through projects. The practice was recognised with a RIBA Design Award for Tadcaster Swimming Pool in 1996. At the end of the decade, the emphasis moved to high rise/density residential housing. One of our most recognisable project, ‘Barrier Point’ adjacent to the Thames Barrier Park, was commissioned in 1997 and completed in 2001. We extended our experience in large residential projects and diversified into new areas, with commissions for the University of Leicester and Network Rail. Succession planning began to ensure continuity and four new directors, David Evans, Lee Fogarty, Lawrence Foster and Robin Gimblett, joined the leadership of the practice. Tony is now semi retired, Don is still heavily involved in the design process.